The 21 inch CleanFreak floor polishing machine is a propane powered, ultra-high speed (UHS) burnisher that gives floor care professionals the performance of higher priced units at a more affordable price. 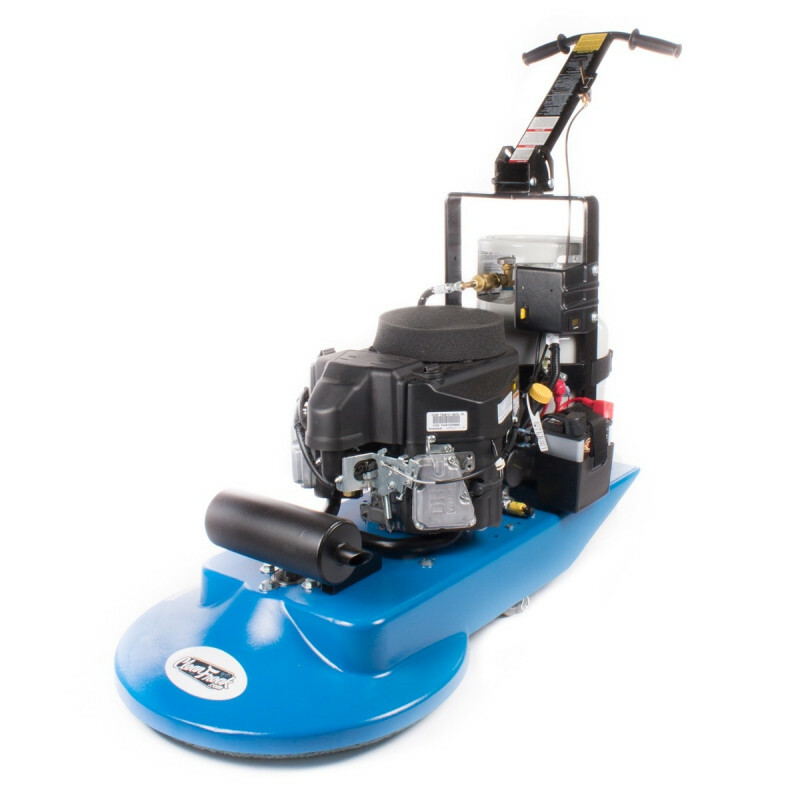 This floor polishing burnisher is powered by an 18HP, 603 cc Kawasaki engine and uses 34 percent less fuel and requires 40 percent fewer oil changes than other machines in its class. This propane floor burnisher has the easiest pad changing system in the industry. Simply remove the propane tank and adjust the handle all the way up, then rotate the machine back so it is resting on the back of the machine body. This will essentially leave the bottom of the machine perpendicular to floor, putting the pad at about chest level for easy change out. When used with the proper pads and chemicals, we guarantee this machine will provide a superior shine! We know you'll absolutely love this machine and make sure it is backed by an industry leading 2 year engine warranty and 1 year on parts and labor. Move the adjustable wheels towards the back of the machine to increase pad pressure & move them forward to decrease the pad pressure. Equipped with technology that keeps emissions low and reduces fuel as the air filter becomes dirty. Pad driver is belt driven directly from the engine crank shaft. Easiest pad changing system in the industry. 2 year engine warranty with 1 year on parts & labor.